Quality Mumbles brown teddy bear measuring 30cm from head to toe. This cuddly toy has plush faux fur with soft brushed fur palms and feet. Quality Mumbles brown teddy bear measuring 30cm from head to toe. This cuddly toy has plush faux fur with soft brushed fur palms and feet. Soft toy teddy is clothed in a cool dude hoodie. Complies with European Toy Saftey Regulations and manufacturers tag states suitable for all ages over 36 months. 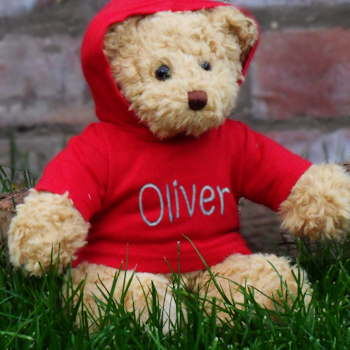 Personalised Cotton Hoodie: We can embroider a single name or initials or a numerical birth date (ex. 3.10.12) in a lettering style of your choice. Please allow 2-3 days for personalised gifts to be made to order.